Andy: This rum has a nice vanilla smell and a nice burn when drank straight. For a similar cost, I would prefer Pyrat XO or Mount Gay Extra Old, but this is definitley a good rum. Adrian: I really like the flavor of this rum. It is no Mt Gay Extra Old, it is a little lighter, but still has a good flavor. Mixed with Diet Coke it is very smooth and mellow but you can still taste the rum. 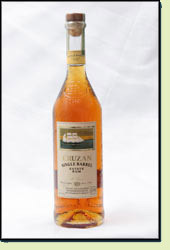 If you compare it to less expensive Cruzan Estate Diamond rum, I’m not sure I would spend the extra money on it for a day-to-day rum, but is good for special events. Crux an is a company built in flavored rums with a lot of sugar added. It’s nice for them to attempt a small batch concept for those of us that like to sip rum or have it with just the minimal of additives. As you guys noted there are loads of better choices but like Bacardi, Cruzan has a huge distribution and you might find this in places with limited small batch offerings. I think in those instances it nice to have this as an option.